In recent posts, Kent has shared his process for songwriting in general as well as background for how he was inspired to write each song for our current project, I Wanna, Iguana! In today’s post, I share how Kent transitioned from songwriting to recording our second album. 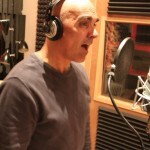 After Kent was happy with the song structure he created in his home studio, he recorded a demo of his work. 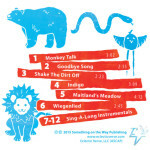 The demo of each song provides a rough representation of his musical concepts. He records guitar tracks, vocal track(s), a bass track—either playing the bass guitar manually or using a stock loop from his recording software—and a percussion track—using drum loops from his recording software. I should step back a minute and talk about “tracks”. 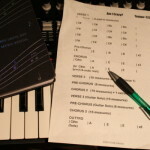 In today’s computer-facilitated recording world, a music composition might have a dozen or more tracks. Think of a track as an individual component of the music composition. Each role gets its own track. So if you have 2 singers, you have a track for each. If a singer duplicates his/her vocals (sings the same notes twice to provide a fuller sound), then that one singer will have 2 tracks. Regardless of the quantity of the tracks, the tracks line up in parallel (beginning at the same point) and provide the entire structure for the song. 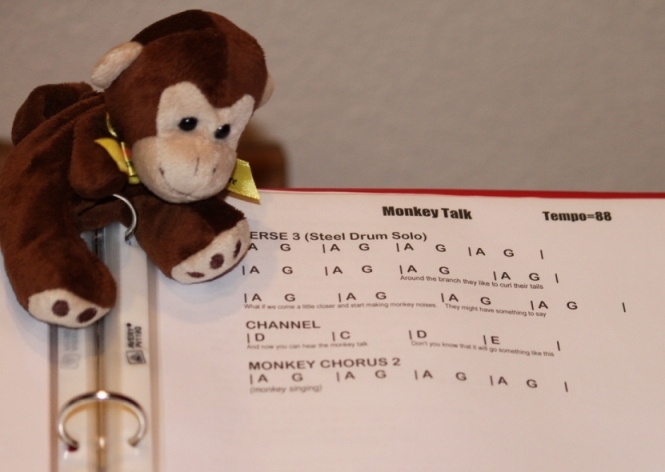 After creating a demo of each song, Kent then created charts for each part. Guitar players (bass, electric, acoustic) use what are called “tabs” to record the notes that need to be strummed. Whereas, a vocalist needs to see all the notes she is supposed to sing. A drummer just needs to see the beats (how many beats per minute) and in what time signature (e.g., 3/4) the song is written. The chart will also include how many measures each section of the song has so all of the musicians know where they are and when changes happen. Once all of this collateral information is created, decisions need to be made regarding who will play the parts that the songwriter is unable to perform on his own. Kent is an accomplished guitar player (both acoustic and electric), but is not as strong of a bass guitar player, and is not a drummer. So for our current project, we chose to hire session (also known as “guest”) musicians to cover those pieces. You can read more about the musicians we’ve worked with both on our first album Something on the Way and our latest album, I Wanna, Iguana! on our Bios page.